The only Datsun 1200 that came with a 5-speed was the Japan-market 1972 GX-5 model. However any A-series 5-speed will bolt to the A12 engine and work in a 1200 as-is or with some degree of modification. 2 Why Should I get a 5-speed? 3 Why should I not get a 5-speed? 4 What types of 5-speeds are available? 5 How easy it is to swap in? 6 Where can I get one? 8 Are there any close-ratio or non-overdrive 5-speeds? 9 How Strong are they? 12 What about my Speedometer? 13 What about using a non-Nissan 5-speed? Why Should I get a 5-speed? Adding an overdrive 5-speed is one of the best improvements that can be made to the Datsun 1200. More relaxed, quieter, more fuel-efficient highway cruising will result. This was Mareo's idea, and I think he might be right. Then there is the performance 5-speed, which does NOT lower RPMs on the highway, does not improve fuel economy. This is the GX5 transmission, it provides an extra gear in-between 1st and Top. These gears allow you to shift more often, keeping the engine in the fattest part of the rev range for quicker acceleration. The only A-series gearbox that is non-overdrive like this is the 56A 5-speed. Why should I not get a 5-speed? On the other hand, if you don't do much highway driving consider that the A12 4-speed is lighter and cost less. It's also better suited to the stock A12 torque curve than any of the overdrive gearboxes. It has a relatively steep 1st gear for effortless take-offs even with 4 passengers, yet still allow a 90 mph top speed, while 80 mph cruising @ 5000 RPM is perfectly do-able if a bit noisy. Remember, the Yellow Line doesn't even start until 6000 RPM on a Datsun 1200. Also, a 5-speed won't improve your top speed. Datsun 1200 top speed is about 95 mph and is HP limited (not gearing limited). Highest speed in the 1200 GX5 is achieved in 4th gear as it needs to run at 6000 RPM to make enough power. What types of 5-speeds are available? The 5-speed versions were 1:1 direct fifth-gear (non-overdrive), called in Japan "direct mission"
How easy it is to swap in? Any A-series rear-wheel-drive 5-speed will bolt up to any A-engine. Slight modifications may be needed to fit into Datsun 1200. And, A14/A15 5-speeds will handle the extra torque of these motors (The A12 4-speed is a little weak to use with an A15). In USA, the B310 5-speed is common and inexpensive. Just look for a 1979-1982 Datsun 210 (Nissan body type B310 aka Sunny). You can often buy a whole car for about $500 or less. In the wreckers, transmissions go for about $200 u-pull. The B210 5-speeds are less common, but go for the same price if you find one (prices last checked in 2010). In Australia, ask around. They can be hard to find and expensive. Most of the 5-speeds use a "dogleg" shift-pattern (aka 'reverse shift'). ONLY the 60A 5-speed is a non-dogleg. It was used starting with 2nd-year B310, from late 1979. Are there any close-ratio or non-overdrive 5-speeds? 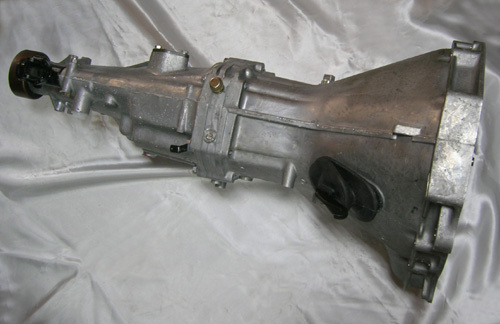 The 5-speed transmission (F5W56A) was originally installed on certain non-USA models of the 1200 [JDM Datsun Sunny 1200 GX5]. With the stock gearing this transmission works very well for street, slaloms, high-speed time trials or rallies. With the optional gearing (32010-H7220N), it is the best production-based transmission available for racing versions of the 1200, B210 or 210 Datsuns. The synchro mechanism is the servo-type (steel). The Part Number above [3210-H7220N] is a Nissan Competition number. They often put N or R after the regular number. Without or without the 'N' suffix, that number describes the 56A five speed 'Option 1' close ratio competition transmission for these models. The F5C56A [JDM Option 1] is as rare as hen's teeth. These were racing parts, and thus are difficult to find and expensive. Some Japanese dealers fitted them to retail GX models for special customers. The Japan domestic model Datsun 1200 GX-5 came with the wide ratio F5W56A as standard. This was also available from Datsun Competition. The Option 2 box was for Japan Domestic Racing. The factory 1974 Datsun B110 Competition Tune Up Manual lists only the Option 1 & 2 four speeds which were superseded by the Option 1 five speed. The ratios are as listed above except for 4th gear which is shown in this book as 1.182. The factory 1974 Datsun Sunny 1200 [K]B110 Sports Option parts Catalogue lists only the Option 1 five speed with the ratios matching those listed above exactly. There was no Option 2 five speed listed in the Japanese Datsun Sunny 1200 [B110] Factory competition literature. The factory "Datsun 1200 Sports Option Parts" Catalogue for the "Model: B210, KB210 Series" lists an Option 1 five speed 56A transmission. It is identical in every way to the one listed in the 1200/ B110 factory competition literature. There is no Option 2 transmissions listed here either. The stock B210 Sunny GX5 used the F5W56A transmission. Gearboxes are rated for torque (twisting force). Peak Horsepower is not a factor. It doesn't matter how much horsepower you have; whether you need a stronger transmission depends on how much torque the engine puts out. For example, the lo-po 65hp A14 makes more torque than the 69hp A12. Datsun boxes are numbered by the distance between the centres of the countershaft and the main shaft. 56 series 56 mm, 60 series 60 mm, 63 series 63mm. All 56-series and 60-series RWD transmissions are the same length. 4-speeds and 5-speeds are the same length. So they all use the same driveshaft. When fitting a 60A or 60L gearbox, there is no need to swap driveshafts. FS5W63A and B110/B210 Automatic are slightly different length than 4-speeds. The driveshaft is 15mm longer than a 4-speed driveshaft. So obtain a 1200 automatic driveshaft. NOTE: FS5W63A from non-B210 may be different length. Per (ROConnor): "I hav here a 63A#1 dogleg 5-speed, and a 56A 4-speed that both measure 660mm from the mounting face to the end of the output shaft (so may be diferent 63A's?)" Well, speedometers are generally off in the first place. But, yes, your speedo may read incorrectly if you change transmissions. On the 5-speeds, the speedo pinion gear will interchange from the 4-speed, BUT there is usually one less tooth on the 5-speed output shaft. This makes the speedo display faster than the actual vehicle speed. What about using a non-Nissan 5-speed? Toyota 5-speeds have been used successfully by several club members. If you want to spend a little you can also get a conversion kit for a Toyota 5 speed. These boxes are stronger, lighter, more easy to find, yet less expensive than Datsun 5-speeds. 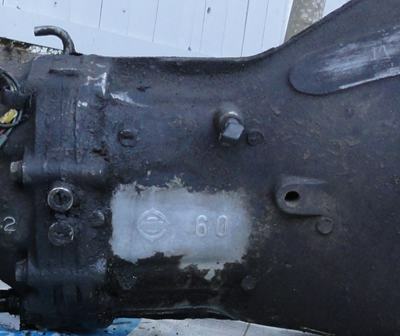 To identify a transmission, look for the series casting mark (56, 56A, 60, 63) on the left side of the gearbox, but there are many other identifying features to tell whether it is a 5-speed or a 4-speed. Discussion about transmission differences: GEARBOX NUMBERING AND BASIC INFO. NOTE: -L and -A do not indicate the engine type the transmission fits (bellhousing pattern). There is an FS5W63A for L16 engines, and an FS5W63A for A14 engines. This page has been accessed 163,689 times. This page was last modified 00:01, 24 August 2018. Content is available under Datsun 1200 Club.